Happy Labor Day! I hope you are doing something fun today! We're doing a lot of "catch up" around the house --doing laundry, cleaning the garage... but of course I did some stamping, too! There are quite a few challenges in this one card! I did today's Technique Challenge at SCS (Black Magic), the Meet the Verve Divas Challenge (using unloved supplies), the Verve Project Parade (brown and pink), and Jen del Muro's Sketch for You to Try. All of them came together pretty easily once I got started! Okay, so here are the details. I used my Prismacolor Pencils dipped in OMS to color in the flower image which was stamped in SU! white craft ink. I used a few "unloved" supplies: SU! Berry Bliss paper (I HAD to have it but have used it once before now! ), ticket corner punch (I honestly can't remember the last time I used it), and white detail embossing powder (I don't heat emboss nearly as much as I should). The brown and pink color scheme is perfect for the Verve Project Parade -- the brown and pink inspiration piece is so yummy! 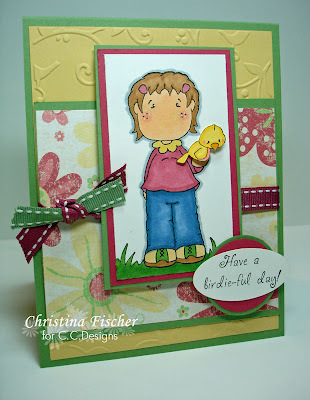 I love Jen's sketch this week -- it was perfect for this image and sentiment from Beautiful You by Verve Stamps. The small flourish is from Fairy Tales, also by Verve. If you don't mind, I have a couple more blog awards I'd like to share with you today. Candy from I Love Chocolate gave me this Javablu Award -- thank you, Candy! Anna Sutherland of Funky, Fresh and Fun gave me this award. Thank you so much, Anna! Hello, everyone! I hope you're enjoying the long holiday weekend! Today's Sunday Supper recipe is a one-dish recipe that takes less than 10 minutes to prepare -- I just love that! In 3-qt oblong baking dish, combine soup, water, rice, mushrooms and 1/2 can onions. Arrange chicken on rice mixture; sprinkle with paprika and pepper. Bake at 375 degrees F one hour or until chicken is no longer pink. Top with remaining onions; bake 3 minutes or until onions are golden brown. Serves 4. Something Old: I stamped the shirt on old SU! paper, Spring Flowers. Something New: I used my new set from Gina K. Designs, "Little Tees." Something Borrowed: I "borrowed" THIS DESIGN from Carolyn King. Something Blue: Megan's school colors are blue and gold, so I used blue cardstock and ribbon. I received this award from two people. Mauna from Ink~Paper~Scissors gave it to me about a month ago, but I forgot to post it -- so sorry, Mauna!! I received it again this week from Denise at The Crafty Den. Thank you so much, ladies!! Happy Friday, everyone! 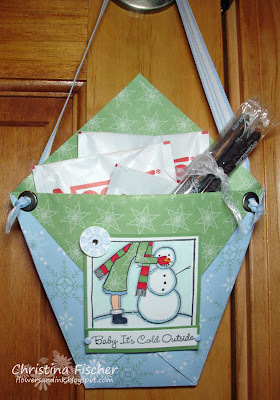 I have today's project for the ATS Blog Hop! We're doing a "Review Preview" featuring the sets Sugarplum Scenery Set and Sugarplum Sentiment Set. 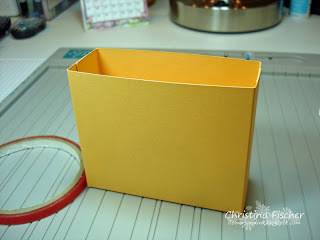 I made a mini tote with four 3x3 note cards. 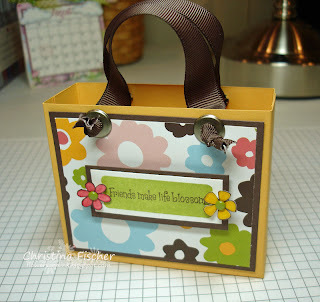 It's the same tote I made for THIS post, but in that case I used it for a gift card holder. It is an easy project which can be adapted for any purpose! Just click on a photo to get a better view. To make the tote, start with a 6" x 8" piece of cardstock. Score it 1" from the top and bottom and 3.25" inches from either side. Fold on the score lines and cut to make the side tabs. At this point, you can turn the cardstock over and stamp or emboss the surface. I chose to leave mine plain. 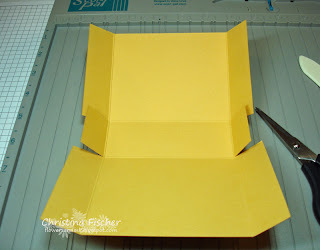 Using Sticky Strip or other strong adhesive, fold up the sides and adhere. Decorate the tote as desired. I used American Crafts paper for the background. 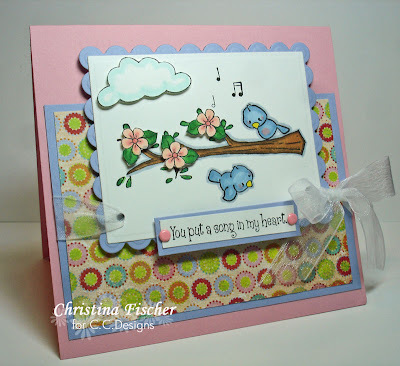 The sentiment and stamped rectangle are from Sugarplum Sentiment Set. The two flowers are from Sugarplum Scenery Set. I stamped them, colored them with Copics, cut them out, and added brads to the centers. For the handles, I slippped grosgrain ribbon through Jumbo Eyelets and knotted the ends. You could also attach the ribbon with brads. I made the 3x3" notecards with C.C. Designs white cardstock. I scored two lines along the bottom of each card, then I stamped the flowers and sentiments from the Sugarplum Sentiments Set. Quick and easy! Hi there! Happy Thursday! 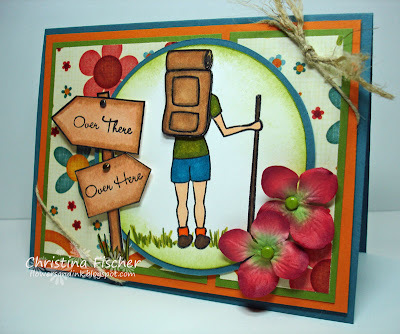 I made this card for today's Ways to Use It Challenge at SCS. The challenge is to use colored pencils. Mine hadn't seen any action for quite a while, so this was a fun one for me! The image and sentiment are from Summer Harvest by Gina K. Designs. I really love this set -- especially this time of year when so many summer fruits abound! I colored the image with Prismacolor Pencils blended with OMS. Isn't this Summer Picnic paper perfect? I'm so glad it's in the new SU! catty! I used Circle Nestabilities for the image and matting. 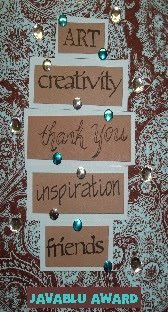 I added brads to the sentiment and Dew Drops to the corner of the patterned paper. The dotted ribbon is from Michaels. "If you like pina coladas..."
"... and gettin' caught in the rain..." If you could SMELL this card, you'd be singing that song, too! 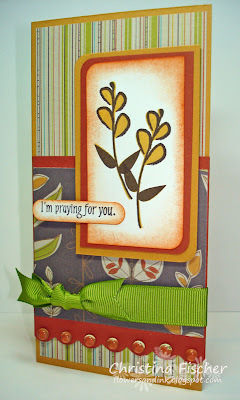 Today's ATS Challenge is to create a Scented Card. Some ideas to use are Card Scents, Embossing Powder mixed with Kool-Aid or Crystal Light, or Scented Gelly Powder. There are some directions from SCS on making a Scratch and Sniff card HERE. I colored all the images with Copics. I cut out the flower and drink and popped them up on rolled up glue dots. I sponged around the image panel with River Rock ink, and I added some highlights to the bear with a white gel pen. I scalloped the bottom edge of the Ginger Blossom paper and finished the card with white organdy ribbon and some Ruby Red brads. 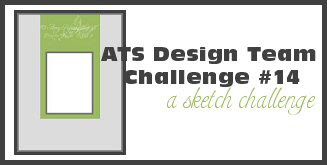 All the ATS Challenges can be found HERE -- do any one at any time! Remember, Christine and Amy are looking for the first C.C. Designs Guest Designer -- it could be YOU!! Design Team samples for today's challenge will be posted on the ATS Blog later on, so stop by to see them! Hello! Happy Tuesday! I made this card for today's Color Challenge and also for yesterday's Technique Challenge (faux dry embossing). I have to say that this design didn't translate to paper the way I had planned -- it was a lot different in my head. Oh well, I think it turned out okay anyway! I was glad to use my SU! stamps -- they've been much too neglected lately! I stamped the flourish from Baroque Motifs once in White Craft ink and again in Creamy Caramel, using a Stamp-a-ma-jig to get it positioned just right. I stamped the flowers in Rose Red, cut them out, and attached them with the black brads. I added distressing and piercing to the edges of the panels, and I sponged around the sentiment to "dirty" it up just a bit. I did some actual dry embossing along the bottom with my Cuttlebug and Frills embossing border -- I like the way it "peeks" out from the torn cardstock. I added black satin ribbon to the front and finished the inside of the card. Christine is retiring some of the older C.C. Designs stamps. To send them off with a big bang they will be 25% off. The Retirement Sale runs through Sunday, August 31. For more info on the SALE and the retiring stamps, go to the ATS Blog post HERE. Hello! Today's Sunday Supper recipe is definitely an easy one! I got this recipe from my friend Tracy several years ago, and I've made it many times since then. Mix ingredients in a baking dish and cover with foil. Bake at 350 degrees F for 3 hrs. This takes about five minutes of prep, then you have lots of time until it's ready! Serve over rice or noodles, add some salad and bread, and that's it! Please send me your easy supper recipes -- I'd love to share them here! For my card, I created the card base with Always Artichoke cardstock, cutting away all but 1.5" of the front panel. I scalloped the edge of the front flap with a corner rounder (paper guide removed). I then ran that flap through the Cuttlebug with the Forest Branches embossing folder. I created the scene on white cardstock, then attached it behind the front flap. The birdhouse and birds were stamped, colored, cut out, and mounted on dimensionals. I stamped an additional roof onto brown paper from my BasicGrey Sugared pack. I cut it out and mounted it on the birdhouse with more dimensionals. I used some natural hemp twine to "tie" the birdhouse to the branch. I stamped grass from the Sugarplums Scenery Set along the bottom. I sponged the front panel with Soft Sky ink. All coloring was done with Copics. I added Dew Drops along the top to finish the card. ETA: I realized after I posted this card that I forgot to back the white cardstock with another layer, since the Copics bled through. I cut a 5.5" x 4.25" piece of Soft Sky cardstock and adhered it behind the front panel. It doesn't show from the front, and the inside is much cleaner!! Now, check out the blogs of my ATS teammates to see who is giving away the gift certificate! You will surely be inspired along the way! A Cupcake with Sprinkles... and A Guest Designer Opportunity! Okay, that's not the reason you're here, so I'll move on to the card! I made this one for yesterday's SCS Sketch Challenge. 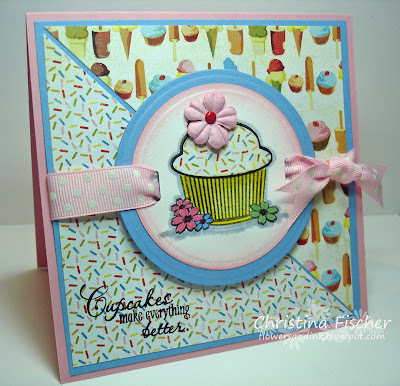 I used some new goodies on this one: new Cupcake dp, new Cupcake Affair stamp set from Verve Stamps, and new Circle Nestabilities!! I paper pieced the top of the cupcake and colored the rest with Copics. I sponged the edge of the image circle with Pretty in Pink ink. 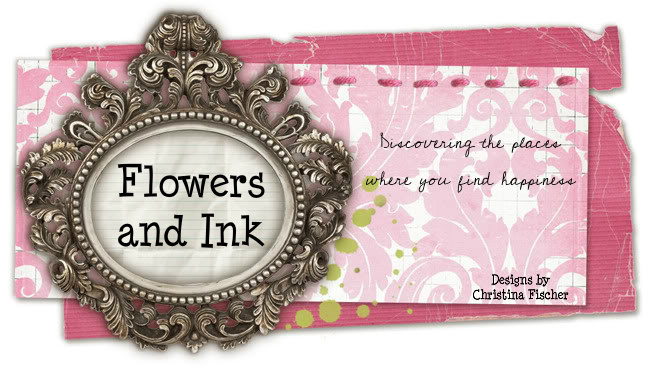 Do you want to be a Guest Designer working with the latest stamps from C.C. Designs? What do you have to do? Participate in the Challenges and post links to your work. Upload your projects to the All That Scraps Gallery. There will not be a call for the guest spot, but the designer will be chosen by Amy and Christine via participants in the challenge/gallery uploads, etc. We will have our official first Guest Designer in October - he/she will receive all the stamps being released that month!! Good luck to all of you -- can't wait to see your creations! See THIS POST on the ATS Blog for the details. Hello! It's Wednesday, so it's time for the ATS Wednesday Challenge. This week's challenge is a sketch from Amy Rysavy. It's a simple sketch with many possibilities! Since two more of my kids went back to school today, I made my card in honor of them. I used Olivia from Olivia's Birdies and the sentiment and backpack from Daphne Goes to School, both by C.C. Designs. The paper is Sugared by BasicGrey. Olivia is colored with Copics. 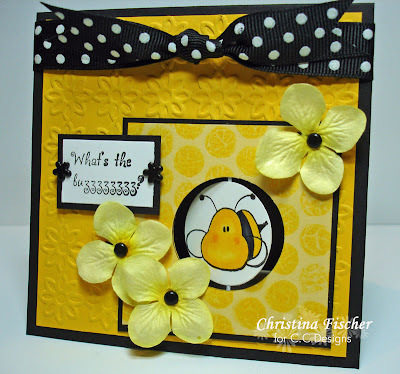 I stamped the sentiment repeatedly on the yellow paper to create a background. The backpack was stamped on the flowered paper, cut out, and popped up on dimensionals. I used a craft knife to cut a slit under Olivia's hand, and I slipped the handle of the backback into it. Embellishments are SU! ribbon and Dew Drops. 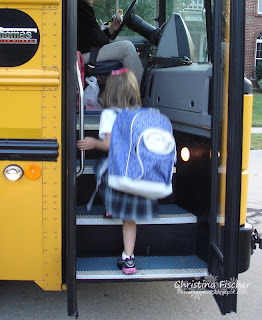 ... and here she is getting on the bus. Happy Tuesday! I hope you're having a good day! Kyle started back to school today -- one down, three to go! ;) Megan and Anna go back tomorrow, and Caroline doesn't start preschool until September 3. I'm seeing some more stamping time in my future! 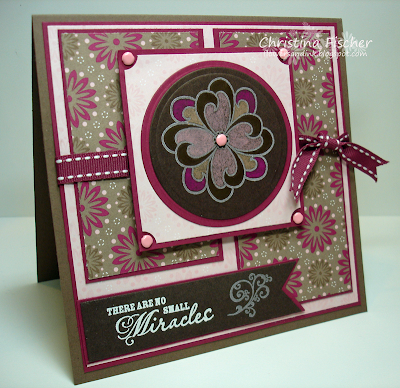 This card was made for today's SCS Color Challenge -- Ruby Red, Close to Cocoa, and Blush Blossom. Until recently, I hardly EVER used Blush Blossom, but I'm really starting to love it! This color combination definitely pushed me over the fence -- it's just a warm, comfy combo! The background is embossed with the Cuttlebug and Leafy Branch A2 folder. All the stamped images are from Cornish Heritage Farms. I sponged all the edges with Close to Cocoa ink, and I pierced around the image panel. 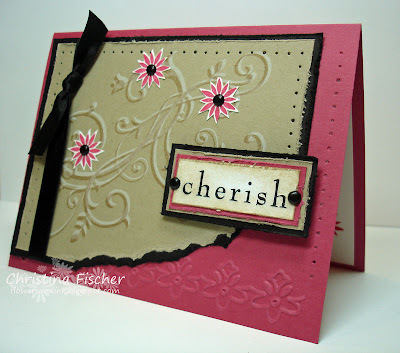 The chipboard flourish is from Jigsaw Flourishes by Making Memories -- I think it's my new favorite product! I picked up three packs of them while I was at Archiver's in Columbus last weekend! Fair warning: you might see these on everything for a while! I covered this one with Ruby Red craft ink and attached it with glue dots. 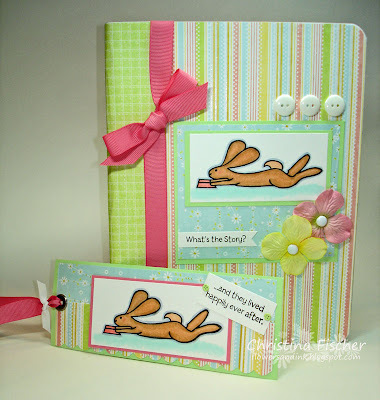 Featured Stamper... and a Tag! Hello! Happy Monday to you! I hope you had a great weekend! I kept the same layout but changed the images, colors, and papers. I embellished with different ribbons, and I used Primas instead of the jumbo brads Jessie used. The image is Karen Stolper's Gifty Girl by American Art Stamp, and the sentiment is from the Sugarplum Sentiment Set by C.C. Designs. I colored the image with Copics and sponged Old Olive ink around the panel. I also added some piercing. The paper is Cupcake by BasicGrey. Before I go, I wanted to say that I've been tagged! Others have tagged me before, and I'm embarrassed to say that I don't always get a chance to answer the questions or pass on the tag -- I'm sorry!!! I DO appreciate the tags and awards, I just forget to add them to my posts until it's too late!!! While typing up this post, I happened to remember that Keri Sereika had just tagged me last week -- so I'll finally get to answer the questions! Here are six random things about me. You may or may not find them interesting, but here goes! 3. I have four children. My oldest two are two years apart, then a seven-year gap, then two more who are two years apart. 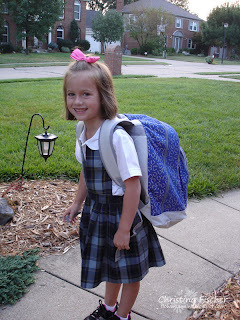 So, now I have two in high school, one first-grader and a preschooler. Do you understand now why I stamp?!?!? 4. I am the oldest of three children, and I'm also the oldest grandchild on both sides. My youngest cousin on my mom's side is only three years older than my son. They were in high school together last year! 5. I'm a teacher by profession, although I'm a SAHM now. I graduated with a double major (Elementary and Special Education) from Xavier University, then received my Masters Degree in Elementary Education from Northern Kentucky University. I tutor part-time now, but I think I'll end up back in the classroom someday! 6. My favorite number is 16. My birthday is December 16, Chris's is January 16, we were engaged on June 16, married the following June 16, and Anna's birthday is November 16. I was due with Kyle on September 16 (his bday is the 22nd), went into labor with Megan on August 16 (her bday is the 17th), and had Caroline on December 15th at 9:30 pm (we missed sharing a bday by 2.5 hours!). Okay, that's probably more than you ever wanted or needed to know about me! Thanks so much if you're still reading! ;) I can't choose just 6 people, so you all can consider yourself tagged!!! Thank you for visiting today -- I hope you have a great day! Boil one box of Rigatoni noodles per directions on box and brown 1 pound of hamburger meat, drain both. Pour noodles into a 9x13 pan sprayed with non-stick spray. Add the hamburger meat scattered on top, added a small amount of cheese. Top with spaghetti sauce and sprinkle on the rest of the cheese and bake in a 350 degree oven for approximately 30 minutes or until the cheese on top is melted. Serve with garlic bread and a salad. Thanks, Lenoria, for sharing your recipe! If anyone has a quick and easy recipe you'd like me to feature here, just email me! Happy Saturday! I hope you are having a good weekend so far! Here's a project I worked on last night. It seems like I haven't done any SCS challenges for a while, so I combined a few on this one! I did Thursday's Ways to Use It Challenge (Copics) and Friday's Limited Supplies Challenge (snowmen). I also did last week's Wednesday Tutorial (Diaper Fold Pouch). I turned mine into a door hanger by adding some ribbon tied through Jumbo Eyelets. The images are from Baby It's Cold Outside by My Favorite Things. I paper pieced her coat and colored the rest with Copics. I added a little sparkle to the snow and her boot trim with some Stickles. There is a rhinestone in the center of the snowflake in the corner. I'm off to take Megan and three of her friends shopping for the day, since her birthday is tomorrow. An entire day with four 14-year-old girls -- wish me luck!! ;) I hope you have a great day -- thanks for stopping by! Happy Friday, everyone!! I didn't get a chance to stamp anything or post anything yesterday. It was a looooooong day of back-to-school shopping with four children... need I say more?? I do have a card that I made last week but didn't share yet. Verve Stamps just finished a 12-day Anni-VERVE-sary celebration filled with daily challenges and contests. 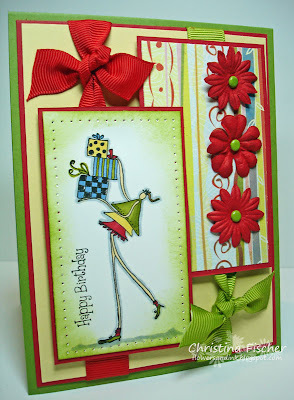 This card was for Julee's Anni-VERVE-sary Sketch #5 and also for Laurie's Meet the Verve Divas Challenge#4 to make a tall and skinny card. This card measures 6.25" x 3.25". 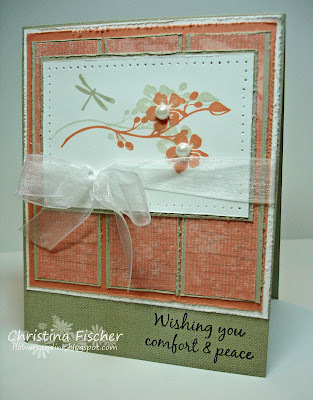 I used the Verve set Serenity, and the patterned paper is Dill Blossom by s.e.i.. The leafy patterned paper is much more brown IRL -- I couldn't get the camera to capture its true color. I sponged around the image panel and sentiment with Really Rust ink. I added Dew Drops to the scallops at the bottom. That's all for today -- thanks so much for stopping by! Have a fantastic day! 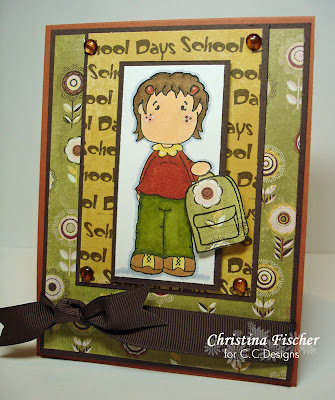 Today's ATS Wednesday Challenge is Suspension Cards. I'm glad Jen came up with this one, because I had never made one before! 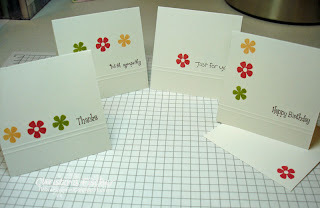 There is a great tutorial at Splitcoaststampers HERE. This card measures 4.25" x 4.25". I knew right away I wanted to use this adorable bee from Bear Hugs. The smaller panel around him was stamped with bubble wrap -- it looks like honeycomb, don't you think? 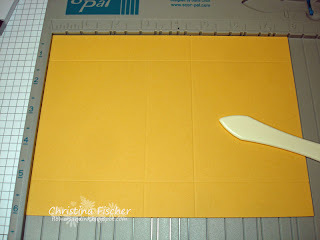 The larger background panel was embossed with my Cuttlebug and the embossing folder from the With Gratitude Combo Pack. The combo packs come with an A2 embossing folder and a die cutting plate -- check them out! To finish the card, I added Prima flowers, brads, and May Arts dotted organdy ribbon. Play along with us! Use keyword ATSDTC13 when uploading to a public gallery. You can play along with any Wednesday Challenge at any time -- just go to the Wednesday Challenge Thread to see all of them! Check out the Wednesday Challenge Gallery to see all the challenge creations -- we'd love to see yours there, too! Sorry I have nothing to share today! We have someone doing construction on our deck, and I haven't been able to sneak downstairs to stamp! I have a couple things that are halfway completed, so hopefully I'll get them finished tonight! I plan to have the ATS Wednesday Challenge for you tomorrow (cross your fingers). Don't forget that the C.C. Designs August Stamps are available NOW!!! There has been a fantastic response to this release -- thank you all so much! 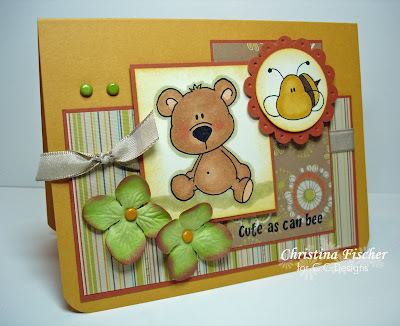 :) Christine also has some great new papers, embellishments, and Cuttlebug folders, so have fun shopping! Hello! Happy Sunday! It's time for another Sunday Supper recipe. Last week I told you I'd be sharing quick and easy supper recipes on Sundays, since I like to take a "day off" on Sunday to be with family. This week's recipe comes from Tammy Hershberger. You can visit her at her blog, Stamp Happy. She shared this recipe with me last week, and here's what she said about it: "My Mom came to visit us this weekend and brought the ingredients for this recipe. We just had it for lunch, and it's fabulous! She got it out of a magazine, but I don't know which one." In a large skillet, cook beef over medium heat until no longer pink. Meanwhile, quarter the biscuits; place in a greased shallow 3 qt. baking dish. Top with pizza sauce. Drain beef; sprinkle over biscuits and sauce. Layer with green pepper, onion, mushrooms, pepperoni and cheeses. Bake, uncovered at 350 degrees for 25-30 minutes or until cheese is melted. Let stand for 5-10 minutes before serving. Yield: 6-8 servings. Thank you, Tammy! I'll definitely be making this one for my family! If anyone else has a quick and easy recipe to share, just email me! There's one C.C. Designs release I haven't shown you, and this one is definitely a must-have! It's the Sugarplums Sentiments. There are sentiments for any occasion, plus some punctuation, shapes, and some little extras! Here I used one of the birthday sentiments with Olivia. She's holding a cupcake from the set It's My Birthday, and it is popped up on rolled up glue dots. 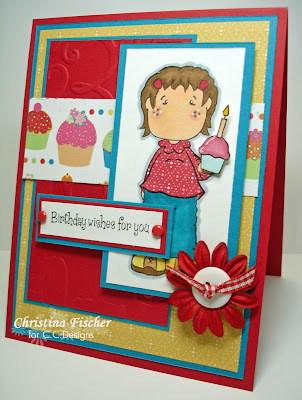 I embossed the red panel with the Cuttlebug and Numbers Collage embossing folder. The cupcake patterned paper is from Junkitz, the background paper is SU! So Saffron Prints, and I paper pieced Olivia's shirt with SU! Real Red Prints. Hi! Happy Saturday! I hope you have something fun planned for your weekend! Chris and I saw Rod Stewart and Bryan Adams last night -- what a fantastic concert! Today is definitely going to be a "catch up" day around here -- the laundry is piling up! I have been eager to share these projects with you. I used the new C.C. Designs Sugarplums Scenery Set. The set contains images which help you make great scenes with your stamps! On this first card I started with some images from Olivia's Birdies. I then used the Scenery Set to add cherry blossoms to the branch and a cloud in the sky. They are cut out and popped up. I cut out the image panel and mat with my Rectangle Nestabilities, and the patterned paper is BasicGrey Romani. I really like the way this next project turned out! I have always admired Sharon Harnist's calendar pages. I thought I'd make an August calendar with the Scenery Set. The calendar page was printed using a Word template. "August" comes from the C.C. Designs Calendar Months set. 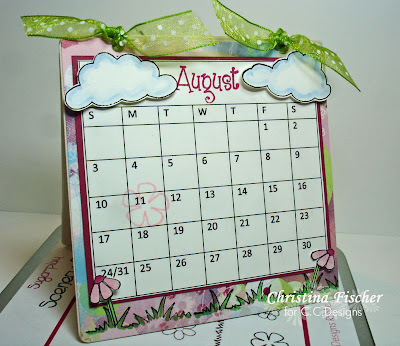 I covered a chipboard coaster with BasicGrey Sultry paper and placed the calendar on top. On the bottom I stamped grass. I stamped flowers for the bottom and the clouds for the top, colored them, and cut them out. They are mounted on rolled up glue dots for dimension. I created a "sandwich" with another coaster -- I punched holes in the tops of both coasters and attached them together with dotted organdy ribbon. I used a flower from the set to stamp around August 11 -- RELEASE DAY!! I hope you'll join us Monday night at the ATS Message Board for a little release party from 8-10 pm EST. Then all the new stamps will be available at 10:00 pm!! Happy Friday!! I have a quick post (and a late one) today -- it's just been one of those crazy days! I wanted to introduce you to Olivia -- she's part of the new C.C. Designs set Olivia's Birdies. I *love* this set -- isn't she just so cute? 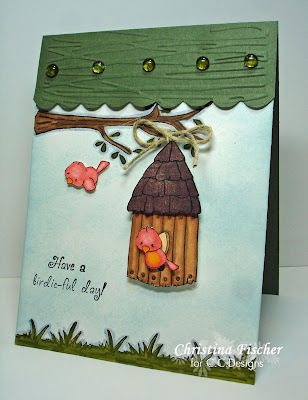 This set has so many great images: Olivia, birdies, birdhouses, a birdbath, sentiments, and lots of little extras! There are just so many possiblities! This design is a simple one, with one of my go-to layouts, but I wanted the focus to be on Olivia. I colored her with Copics. The bird is also colored with Copics, cut out, and popped up with rolled up glue dots. The grass is part of the new Sugarplums Scenery Set -- you'll see more of that tomorrow! Hi there! My week of previews continues today with new C.C. Designs stamps! 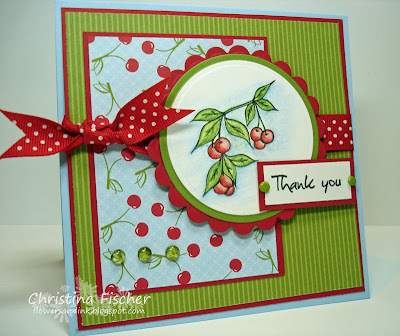 Christine is releasing four new sets -- two from her new Sugarplums line, a set of sentiments (a must-have! 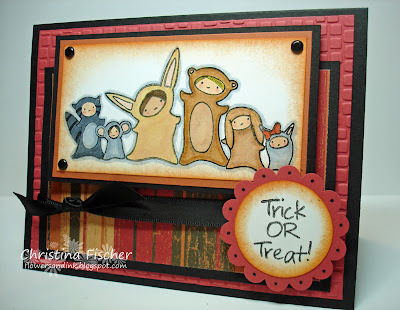 ), and THIS adorable set, Bear Hugs. 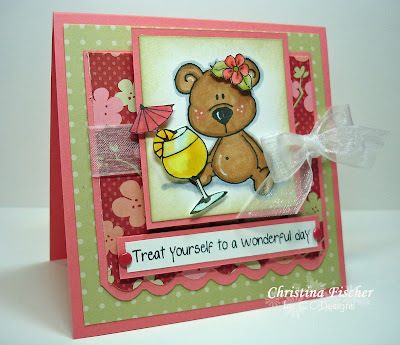 If you fell in love with the bear in the Sweet Treats set, you'll love this one, too! He's back with a little bee friend! Happy Wednesday, everyone! I have two things to share with you today! First is another MFTeaser. I made this card with the sets Nature Calls and What's Your Sign?. Both will be released tonight! The layout is Cindy's MFT Sketch #42. I stamped, colored and cut out a second backpack and mounted it over the first with dimensionals. I drew in the grass line and sponged Old Olive ink around the circle. I used Karen Foster mini screw brads on the signs. The patterned paper is Garden Party by My Mind's Eye. The second card I have to share is for today's ATS Wednesday Challenge. I'll tell you, these colors really had me stumped -- I just didn't know where to go with them. Finally, I came up with something -- my first acetate card! I followed the SCS tutorial found HERE. I used the C.C. Designs set Beautiful Butterflies, and I inked the image with SU! markers. The scalloped edge on the artichoke panel was cut with Fiskars decorative scissors. I added Primas, half pearls, and organdy ribbon. 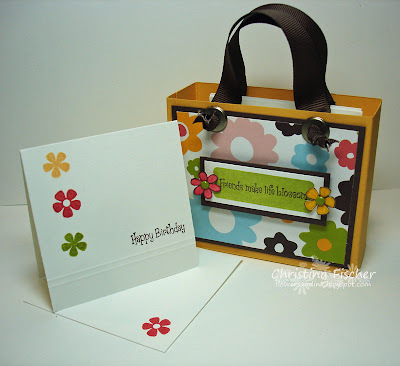 There is also a panel inside for a sentiment or handwritten message. If you want to play along with the color challenge, use keyword ATSDTC12 when uploading to a public gallery. Design Team samples should be posted to the ATS Blog later on -- you can leave a link to your project there, too! I hope you'll be back tomorrow -- my week of previews continues! It's time to start unveiling the C.C. 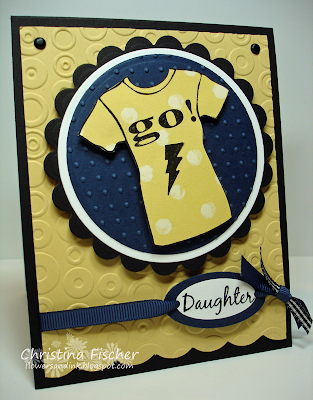 Designs August releases -- you're gonna LOVE 'em!!!!! Thanks so much for stopping by today -- I really do appreciate it! I covered a composition book with For Peep's Sake paper, and I used scraps of the same paper on the bookmark. I colored Flopsey with Copics. On the journal I embellished with SU! ribbon, Euphoria brads and buttons and some Prima flowers. For the bookmark, I tied SU! ribbon through a Jumbo Eyelet, and I added two Pastel Button Babies from Gina K. Designs to the sides of the sentiment. 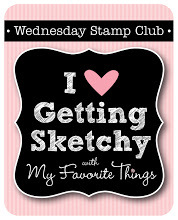 Don't forget -- the New Release Cocktail Party will be tomorrow (Wednesday) night from 9-11 pm EST on the MFT Forum at Splitcoaststampers. Come for MFTeasers, prizes, and to find out how YOU can be the next MFT Guest Designer! For my first MFTeaser I used the set Totally Witchin'. 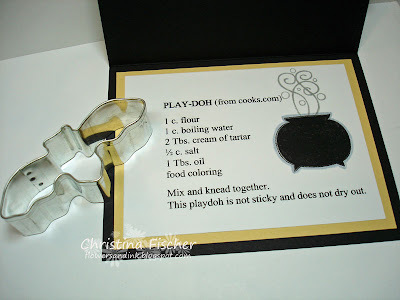 When I saw these ingredients jars, I immediately had the idea to do a recipe card. 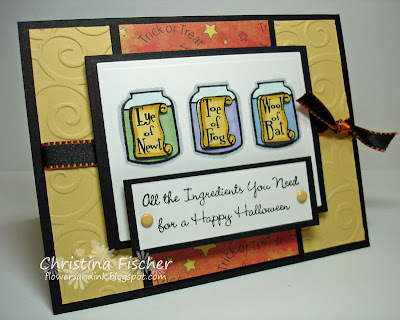 On the front, I stamped the jars in a row, then I stamped them a second time on scrap cardstock. I colored the first images with Copics. I colored the second set of labels, cut them out, and applied them over the first labels using rolled up glue dots for dimension. The image panel and mat were cut and embossed with my Rectangle Nestabilities. 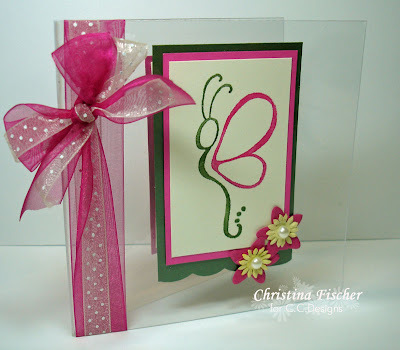 The background was embossed with my Cuttlebug and D'vine Swirls embossing folder. For my second card, I used the new MFT set Monster Squad. Isn't this just the cutest bunch of trick-or-treaters? I used the Tiny Mosaic Cuttlebug folder on this background. I colored the image with Copics and sponged around the edges of the image and sentiment. I added black dots to the scalloped circle. Happy Sunday! 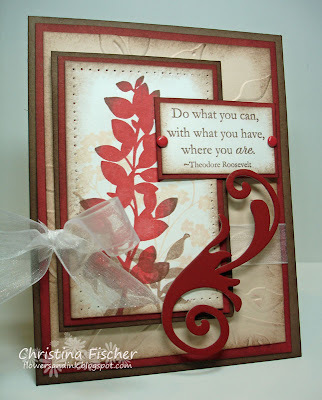 I don't have any stamping to share with you today. Typically, I don't stamp much on Sundays -- it's usually a family day or a day to catch up on that "to do list" around the house. I've been thinking a lot lately about how crazy our schedule is, and I'm really going to try to make Sunday a "day of rest" from the normal routine. I know that many of you are also juggling kids, careers, carpools, homework, sports, and that all-important stamping time. Time around the family dinner table is SO important, so we need some quick suppers to squeeze in between practices, games, and homework! With that in mind, I'm going to make my weekly Sunday post a time to share some quick and easy recipes. I'll call it "Sunday Supper." Prepare stuffing according to package directions. Spoon stuffing across center of 3-qt shallow baking dish. Place chicken on each side of stuffing. Sprinkle chicken with Paprika. Mix soup, milk and parsley. Pour over chicken. Cover. Bake at 400 degrees F for 30 minutes or until done. I'll be back tomorrow with my first MFTeaser -- I'm so excited, and I can't wait to share it with you! Thanks so much for stopping by today -- have a fantastic Sunday! Hi there! It's been a busy few days around here, and I haven't had enough time to stamp! I did get this card finished today, though -- I needed a sympathy card for a friend whose mother died after suffering a stroke. I'm sure I'm not alone when I say that sympathy cards are difficult to make. We certainly don't like the reason we have to make them, and often it's not easy to find the right words to say. That's why I love this set from Gina K. Designs, Comfort & Peace. The sentiments go beyond the standard "with sympathy," and they say what I would express in person. For this card, I combined this week's SCS Sketch Challenge and Color Challenge. Now that Groovy Guava is retiring, I'm actually starting to like it! It figures, huh? I stamped Linen on the Sahara Sand card base and distressed all the edges of the panels. I added piercing, ribbon, and half pearls. The little dragonfly is from the CHF set Nature Silhouettes.